Papa Zoolittle and family take the road less traveled, only to come across prehistoric lands! Ride along in the Jeep to experience the sights and sounds of the Jurassic! 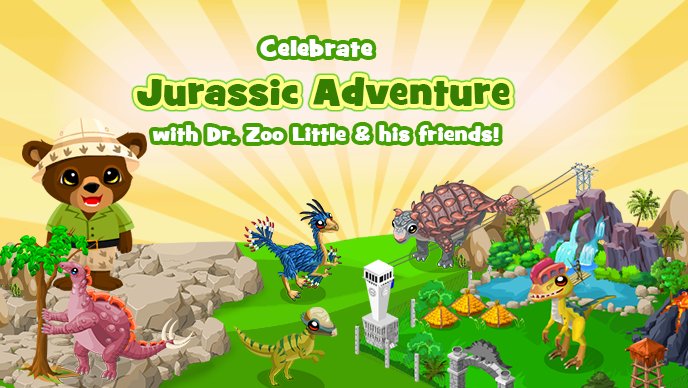 This 2015 Jurassic Adventure seasonal gets started today, so be ready to explore unfamiliar terrain with the Zoolittle family! Read on to discover more about this Jurassic Adventure! Don’t forget upon completing the seasonal, refresh your game to see the final Ultra Rare animal and place from your Storage. Similar to previous seasonal, there are two parts to this 2015 Jurassic Adventure. The first part is inviting guests to your Zoo. The second part – constructing the Dino Adventure Park buildable– will give you a free Ultra-Rare animal to stay in your Zoo when you complete it! When you log into your Zoo, you’ll find a new friend waiting for you at the dock, ready to start the 2015 Jurassic Adventure seasonal. Click on the animal to bring up the Jurassic Adventure menu. From here, you can see what animal guests have been unlocked, choose an animal to help, collect items, and ask friends to help invite these Jurassic Adventure guests to your Zoo! The 2015 Jurassic Adventure seasonal has a story to tell! Each time you invite a new guest to your Zoo, you’ll unlock a new part of Dr. Zoo Little’s story. View the story panels you’ve unlocked so far by clicking the “View Story” button in the Jurassic Adventure menu. Have questions about how to complete the seasonal? Just click on the “How To” button in the Jurassic Adventure Menu for an overview of how to complete the seasonal. Every 3 days, new Jurassic Adventure guests will be unlocked for you to help! There are a total of 7 guests in this Jurassic Adventure seasonal. As with past celebrations, you will need to help the first animal to get the second, and then help the second animal before getting the third, and so forth. New animals will unlock every three days, but you will need to invite the previous animal before preparing the next. The Jurassic Adventure guests will help you complete the Dino Adventure Park buildable to attract the special guest to your Zoo! Read more below to find out how to get this special Ultra-Rare guest to appear in your Zoo! You will need to collect special items to invite these guests to your Zoo. These items are the Dino Fossil, Partial Dino Jaw, Paleontologist Zone Sign, Paleontologist Compass, Trowel, Excavator Chilsel, and Scalers. Each of these can be collected in different ways, and each animal requires a different number of each material. Collect the 2 seasonal items, the Prehistoric Slingshot and Meteorite from correctly answering the Daily Quiz. 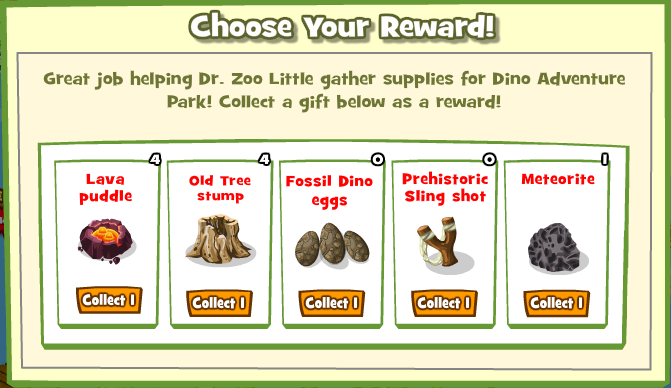 Collect the Lava Puddle, Old Tree Stump, and Fossil Dino Eggs through gifting with friends or feed posts. You can send your friends free Lava Puddle, Old Tree Stump, and Fossil Dino Eggs from the Free Gifts page to help them prepare their own Jurassic Adventure adventure, too! A player can send one request to a friend each day. 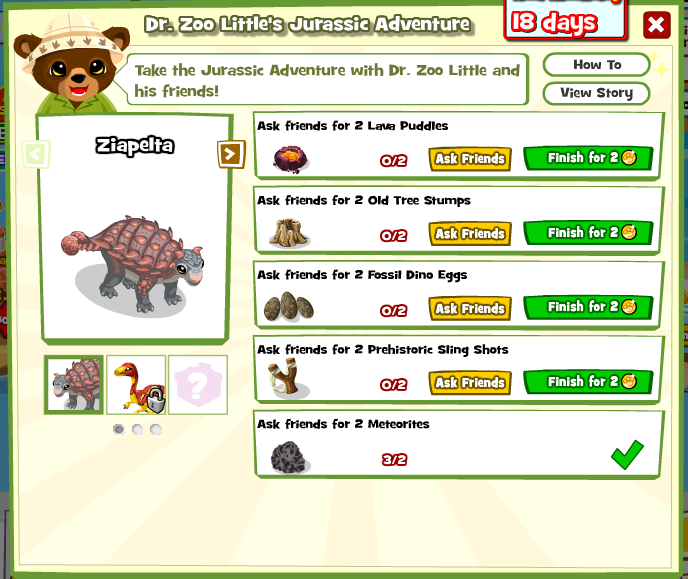 Collect the Prehistoric Sling Shot and Meteorite by visiting your friends’ zoos. 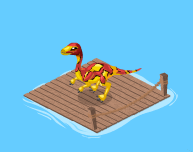 Click on the boat dock in your friends’ zoos for a chance to collect a Prehistoric Sling Shot or Meteorite. There’s a greater chance of getting the Prehistoric Sling Shot, but don’t get discouraged if you receive the Meteorite . It’s all part of the fun! Once you have enough items, click on the “Complete” button to invite the guest into your Zoo. You no longer have to wait for 10 friends to help you invite guests into your Zoo. Congratulations, you’ve invited your first guest! Your 2015 Jurassic Adventure seasonal is well under way. Are you short on a few items to invite to your Jurassic Adventure adventure? Click on the dock to “check-in” every five minutes (and even earn XP)! For every 3 check-ins you complete, you will receive one free Jurassic Adventure item of your choice! If you decide not to upgrade right away, don’t worry! 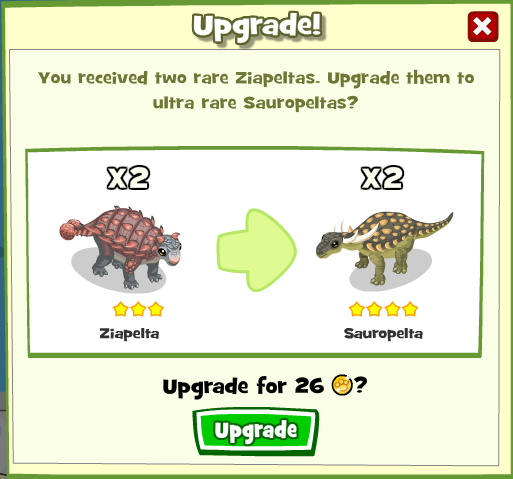 You can upgrade your Rare Jurassic Adventure guests to Ultra-Rares at any time during the promotion by clicking on the animal in your Zoo. The pop-up will have a button that allows you to upgrade. Once the promotion ends, you will no longer be able to upgrade your Rares to Ultra-Rares. Note: You will be able to feed, collect hearts from, and breed Jurassic Adventure guests only AFTER the seasonal ends (i.e. when auto-trade begins). Upgrading your Rares to Ultra-Rares has an additional advantage! As you’ll read below, your Jurassic Adventure guests are busy at work making materials for you to complete your Dino Adventure Park buildable. Ultra-Rare Jurassic Adventure guests make buildable materials 25% faster than their Rare counterparts! Instead of getting materials from the Ziapelta every 6 hours, your Ultra-Rare will give you one every 4 hours! Speed up your Jurassic Adventure completion by upgrading your Rare guests to Ultra-Rares! The first time you open the Jurassic Adventure Menu, you will receive the Dino Adventure Park frame. An adventure like this isn’t complete with just guests; you’ll need something much more festive to attract the special guest! You’ll be asked to place the base in your Zoo after you close the menu. Your Jurassic Adventure guests bring more than just fun into your Zoo this time around! Each guest will make a special material that you need to complete the Dino Adventure Park buildable. It takes each guest a different amount of time to make their materials; you’ll notice that each animal has a timer letting you know how long until its item is ready to collect. ??? – Get from a guest to be revealed on 6/20! ??? – Get from a guest to be revealed on 6/23! ??? – Get from a guest to be revealed on 6/26! When the animal is ready to be collected, the readied material will glow above its head. Click to accept the item. Invite all the guests into your Zoo to collect all the materials you need to complete your Jurassic Adventure seasonal. When the buildable is completed, the Jurassic Adventure guest will appear! 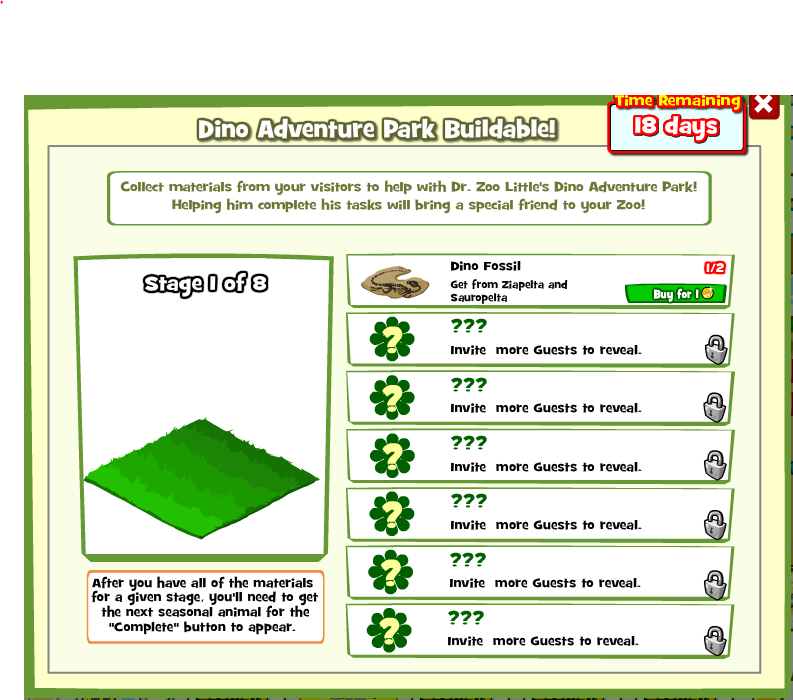 Click on the Dino Adventure Park Frame to open the Buildable Menu. Feeling impatient? You can buy buildable materials for WLP to speed up the completion of your Dino Adventure Park buildable! Once you’ve finished putting together the Jurassic Adventure animals, complete with the Dino Adventure Park buildable and all the guests properly invited, the special guest will be so impressed that it’ll choose your Zoo to reveal its secret identity. But that’s not the final surprise! The mystery guest is an extra-special Ultra Rare animal you get to keep in your Zoo forever as a souvenir when you complete Dr. Zoo Little’s 2015 Jurassic Adventure Seasonal! Remember to refresh upon completion to see the new Ultra Rare completion animal! The 2015 Jurassic Adventure seasonal will come to a close on July 8, 2015 at midnight PDT. On this date, the campaign will and the Auto-Trade will end. Open your Zoo to start your 2015 Jurassic Adventure adventure and be sure to check back often to our Fan Page, Forums, or Support site for updates, additional information, and giveaways! Welcome to the Jurassic, Zookeepers! !